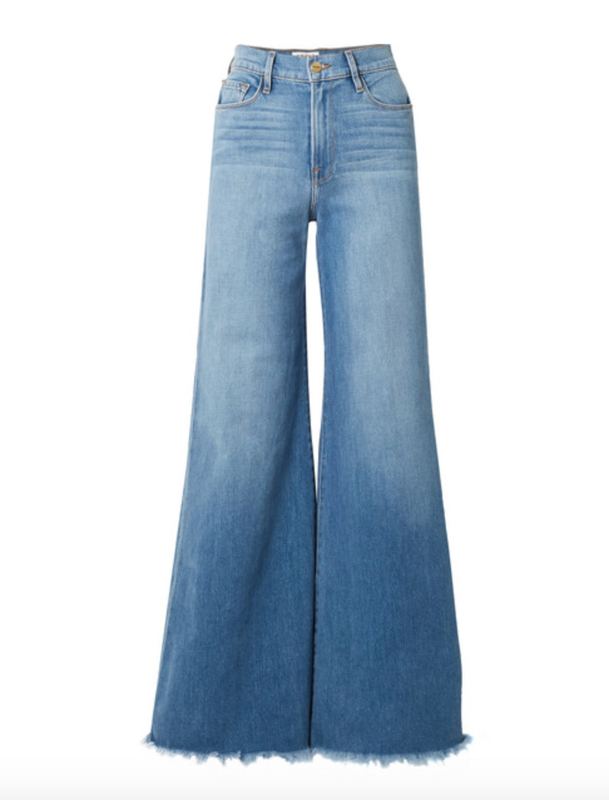 My obsession with ultra-wide legged jeans is longstanding. I've been wearing them since high school, beginning with the "used Levi" styles I purchased on trips to the original Reminiscence in NYC's East Village and graduating to the chicest and sleekest side zip version form Habitual post college (Come back!) When I find a pair with the perfect 70s-inspired, figure flattering high-waist that boldly obscure the platforms below, (think tall, which I am not) I keep -- and wear -- them forever. This pair is just right. Turtleneck and thick heeled boots for winter and a tank top and wedge sandals come summer. Hoop earrings, long charm necklace and costume chains all year long. Now that we are back from our snowy getaway, I'm looking forward to warmer weather. It would be an understatement to say that I am smitten with prints, so Rhode Resort's chic dresses that easily transition from day to night are ranking high on my wardrobe list. 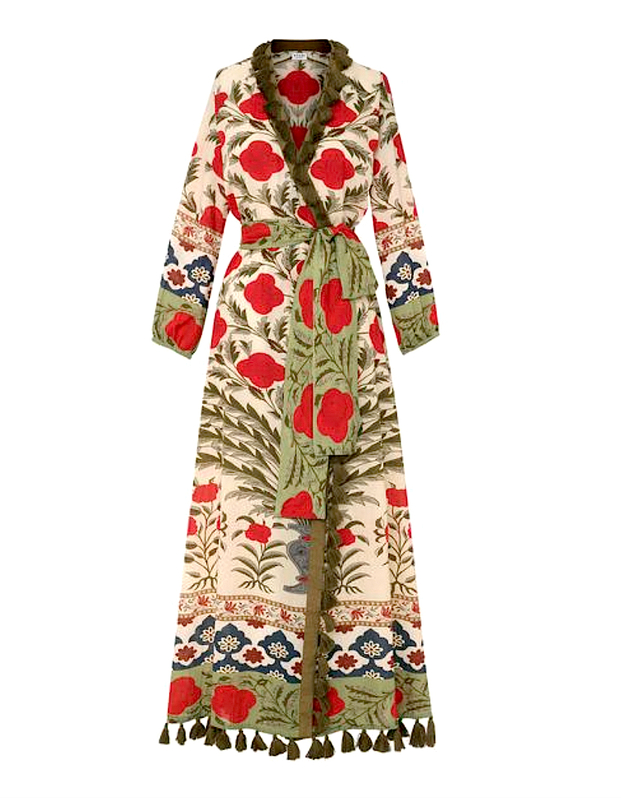 I also appreciate a piece that can evolve from season to season and, while this tassel trim dress is perfect for a beach holiday, I'm looking forward to wearing mine now as a duster robe over a white t-shirt and jeans. Yes, I already ordered the one above here. *And just an FYI: M'oda O'perandi is taking pre-orders on the upcoming summer collection and this cotton zodiac version (I think it's clear how I feel about the signs - Exhibit A & Exhibit B) is happening. Mike insists that I become hostile at the first cool breeze in October and that by winter I'm an absolute monster, my mood worsening with each degree the temperature drops. He eagerly awaits the first stretch of warm days in late spring/early summer because I "become a different person," one that is apparently pleasant - i.e. not angry and accusatory at the weather. But hey, I'm not the one that thought we should move our home base back east from L.A. Just sayin'! Ahem. Outside of warm weather vacation plans on the calendar, happy deliveries neatly packaged with wardrobe offerings of the season - sleek boots, chic wool coats, sophisticated velvets and pretty sweaters - give my husband hope that I will be willing to leave the house and brave the elements. So, I'm excited to once again partner with Matchesfashion.com to share my fall weather picks, as my online shopping bag there has been quite full these days. From casual weekend wear to luxe evening looks, I've selected my absolute favorites - scroll down and happy shopping! Matches ships DHL (Free Delivery and Free Returns) and any returns may be organized by requesting a DHL pickup or by dropping it off at a UPS location that accepts DHL shipments as well. I'm a bit enamored with their luxe boxes and packaging which I reuse in my closet to organize trinkets. *Be sure that you are linked to United States and $USD to see correct pricing if you are shopping from the US. Currently, I'm hyper-focused on the completion of two essays as well as a few very exciting developments for the GC brand. In other words, I'm procrastinating. I'm either all in undeterred by any interference from the world around me or I must immediately clear my head and I'm quickly heading down the illustrious path of being the first person ever to surf the entire internet. So, in a desperate need to take a break from myself, while attempting not to move from my office desk, I've decided to do something mildly productive beyond compulsively refreshing Neiman's clearance sale. Below I'm sharing my latest obsessions, some of which I have found by stalking the World Wide Web (see Neiman's sale) and others I have less shamefully been introduced to in person. Hoping you're obsessed too...And that you'll share your obsessions with me. I have valuable time to kill. Marlien Rentmeester, who I have known since my editor days in L.A., has grown her much-adored fashion blog Le Catch with MAR, a capsule collection of her own designs, including a chic collaboration with handbag maven Clare V. I visited Clare's Soho store during their NYFW launch and got to see Marlien and the painted and personalized MARMY jackets in person. You know I believe in monogramming everything and hand painted military jackets now rank high on my list. MAR X Clare V. Collaboration MARMY jacket, $395 at Mar.lecatch.com. Public service announcement: This is the last batch. 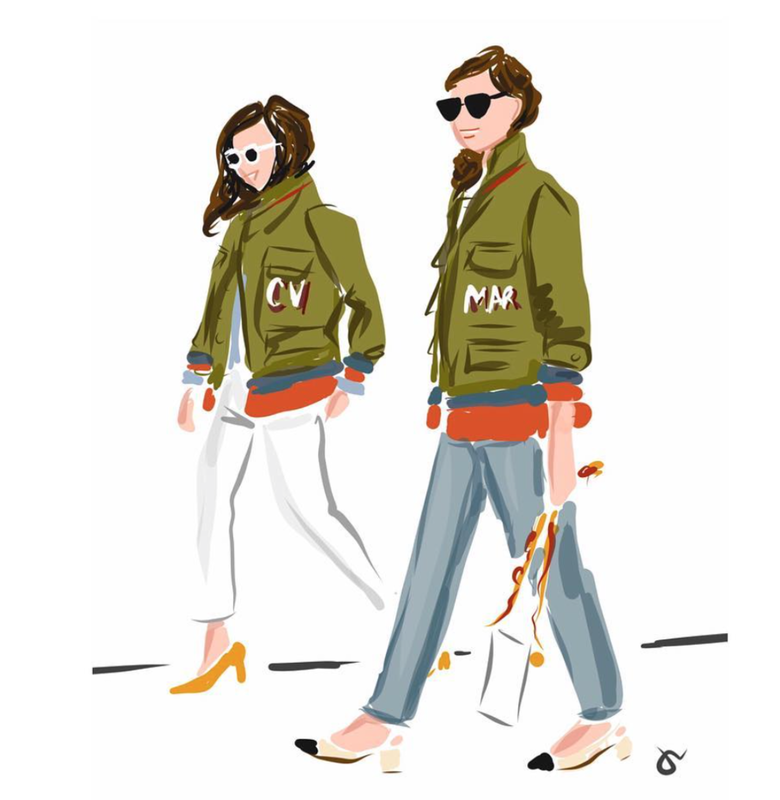 Illustration of Clare Vivier and Marlien Rentmeester by Jennifer Vallez, whose family portraits are a fabulous gift. Plus, she's an artist who's not afraid to speak up for what's right and there's nothing chicer than that. While attempting to hold onto summer, I'm now determined to find some sartorial excuses to look forward to fall. Here are a few more of my favorites for when the temperature drops, including this peacoat that will be mine. Oh yes Mike, it will be mine. Growing up, a white wicker desk, headboard, etagere and mirrors complimented my Laura Ashley floral upholstery and pink and white striped wallpaper. Later on, the souvenirs of teenage reflection - Grateful Dead stickers, Tribe Called Quest posters and the "Dazed and Confused" High Times Magazine cover - that I added to the preppy overload were the perfect juxtaposition. 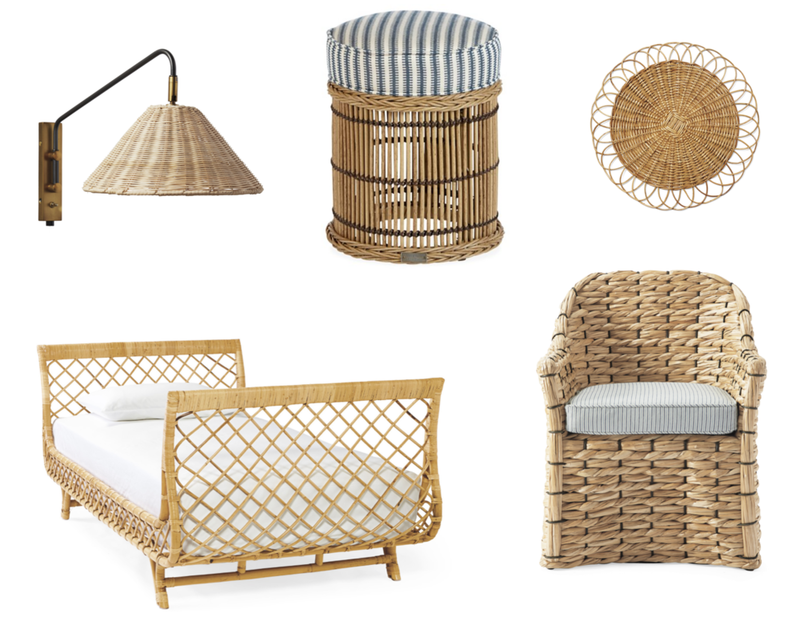 These days, I've been particularly drawn to everything rattan, woven and bamboo, but now I prefer the look in natural hues. I often scour flea markets and antique stores for special scores, but I always appreciate modern pieces that offer an equally timeless look. Here are a few of my favorite images for inspiration as well as some very chic finds. But I'm going to need a pair of these babies in pink. That's all. 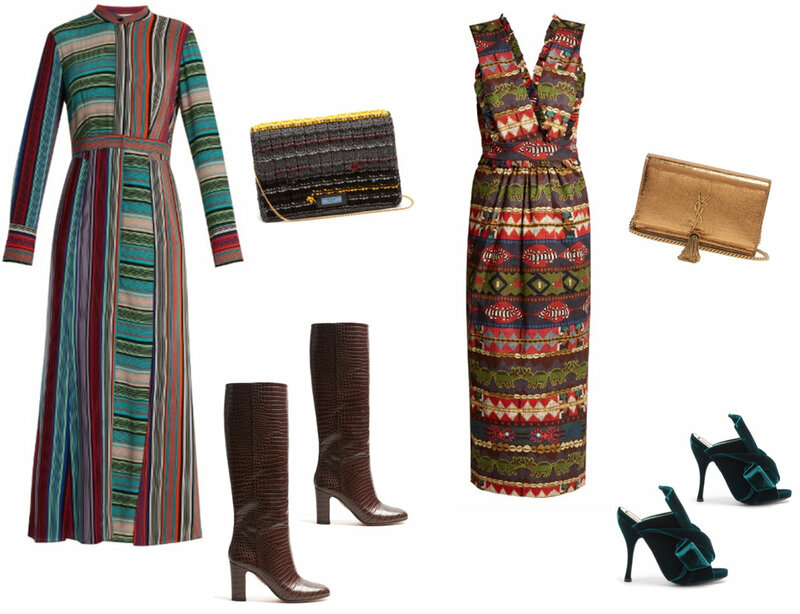 As I mentioned earlier, I take a shameful amount of writing and designing breaks by compulsively refreshing the Neiman Marcus clearance sale. It includes a very happy amount of pieces from Co, one of my cult favorite designers, as well as Gianvito Rossi and Tabitha Simmons. Oh, and it's up 75% off...plus free shipping and free returns. (See how I feel about SALES here) I cannot (will not) stop. The whole thing is ridiculously satisfying. The mascara that I have been devoted to since it landed on my desk when I was the Style Writer for Los Angeles magazine has been discontinued and I've tried countless replacements only to be left with raccoon eyes. Sweetlips and The Bean only use BeautyCounter bath and sunscreen products, thanks to my dear friend who has become committed to safe ingredients. When I was in L.A. a few weeks ago, she insisted that just because Beautycounter mascara is safe does not mean it won't work. I've been a tough convert to that concept. But I tried it. And...I love it! (In full disclosure, I already use their face cleanser, body lotion, lip balm and lip sheers, but I am very particular about eye makeup). No clumpy lashes, no raccoon eyes and I get to say it's non-toxic. I have really been missing L.A., particularly our friends who are family, Pacific ocean views and farm to table living. 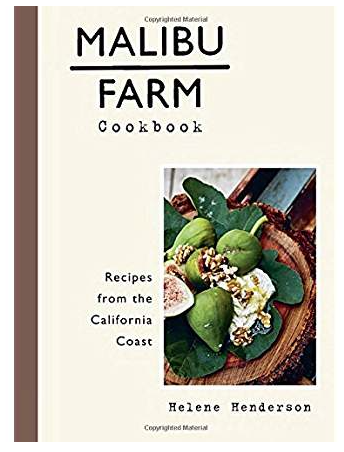 A few weeks ago, we had the most delicious meal overlooking the ocean on the pier at Malibu Farm and one of the first things that I did when I returned to New York was order their namesake Malibu Farm Cookbook. I love enjoying the recipe tome of favorite restaurants or places once I return to my own kitchen (See more here). There is something about the sensory experience of food that can take you back to a place you love. I'm crazy about this cookbook. 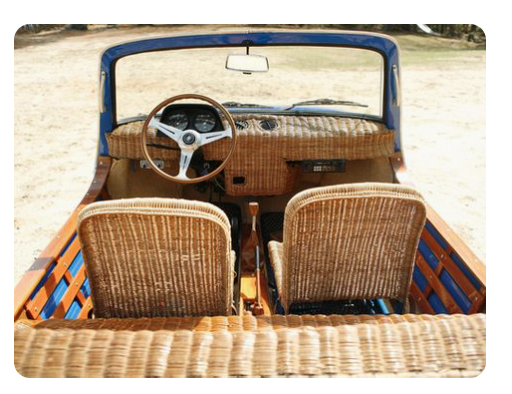 It reminds me of the farmers markets, driving along the ocean and eating fresh, quality food. I am begging you to try the recipe for potatoes. They are so easy and so delicious and excellent for a crowd. My kids (and I) cannot get enough. Plus, I get to pull the rosemary right from my garden. A potato farmer I am unfortunately not. Simple or statement, subtle or bold - the look of a solid gold initial is always classic or timeless. I always wear a GC single Statement letter or a Small solid gold initial piled with my other charms. But lately, I've been very into the idea of wearing multiple Medium letters layered or on a single chain. The look is chic and sleek. The perfect gift for someone else...or just yourself. Last, but certainly not least, I want to mention St. Maarten. While this obsession as of late has not been of the joyful kind, as many of you know from interviews and instagram it has, and always will be, my "happy place." I am heartbroken by the devastation of this beautiful island that is filled with tangible memories for my family, continuing to tether us to my grandparents for whom Garland Collection is named. Garland and Up Chic's Creek are committed to supporting the relief efforts faced by the devastating hurricanes. Our hearts and thoughts are with ALL those in the U.S. and Caribbean whose homes, livelihoods, families and happy places were affected by the storms. We are committed as a brand and as a family to the relief efforts. As we have posted on instagram, 20% of all sales of fine jewelry on the GC site through September will benefit the American Red Cross and UNICEF. As we learn more about what can be done through drives and necessity registries we will share them with you. In the meantime, you may also donate directly to the American Red Cross, UNICEF, the Humane Society and many other organizations on the ground via their individual websites. We no longer live in LA full-time, but rather in denial that our life is not at least bi-coastally filled with palm trees, surf and skateparks. (More on that move here). When our new poolhouse flooded and needed to be gutted to the studs, I comforted myself by modeling it’s decor after the Beverly Hills hotel, Martinique wallpaper and all. We live in a farmhouse and barns, so the juxtaposition may be unexpected, but it works from both a design perspective and an aesthetic coping mechanism. My own version of hygge. EAT: Drop in for a scone at favorite Montecito brunch spot Jeannine’s (my must-have is raspberry. Just sayin’.) Our friend Josh (see saint above) turned me on to Hoppy Poppy IPA from the Figueroa Mountain Brewing Company. Visit their beer garden in Santa Barbara’s Funk Zone where you can order salads, sandwiches and pizzas from the Lucky Penny restaurant next door. Eat under the stars at the romantic and rustic-chic Plough & Angel at tony hotel San Ysidro Ranch. Rori’s Artisinal Ice Cream at the Montecito Country Mart is essential. The “3 Itty Bitty Scoops” for five dollars is a game changer for those that don’t like to choose — I go with Brown Sugar Banana, Nutella and Strawberry Cheesecake. Enjoy dinner at Lucky’s Steakhouse in Montecito. It’s our families’ favorite restaurant. Please order the mac n’ cheese. SLEEP: Ojai Valley Inn & Spa — A bit South of Montecito in Ojai, we often stay here in their Mediterranean villas amongst the lavendar. Four Seasons The Biltmore Santa Barbara — Just across the street from our favorite beach with access to their famed pool, Coral Casino Beach and Cabana Club. If you can snag a cottage, make it happen. When we want to zen just the two of us (and Lola, of course) with ocean views, we head to Bacara for utter relaxation. San Ysidro Ranch will set you back, but this retreat in the Santa Barbara foothills where John and Jackie Kennedy honeymooned is simply dreamy. Save it for an anniversary or birthday treat (hint, hint). GO: Hit Santa Barbara Skater's Point Skatepark to see real Southern Cali skaters in action. The park is closed on Saturdays year round from 9-11 am for free lessons for the kiddos. Visit the lovely and very manageable Santa Barbara Zoo with your family. Make sure to get there in time to feed the giraffes. 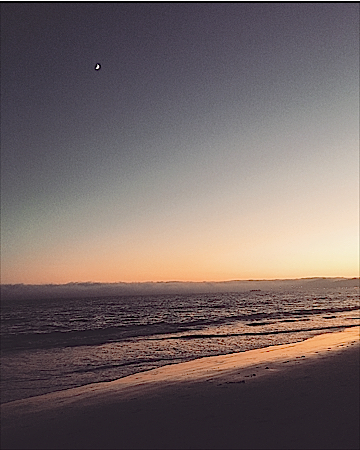 Head to Butterfly Beach directly in front of the Four Seasons Biltmore for a dog day afternoon (your pup will make many friends) or soak in the spectacular sunset over the Pacific. Off the beaten path, take a drive to Los Olivos for wine tasting and a little shopping. Sides Hardware and Shoes - A Brothers Restaurant, will make you glad you did. SHOP: Browse William Laman for beautiful antiques and exceptional accessories. You won’t want to leave. While you are here by San Ysidro Village, check out House of Honey for glam home goods and Jenni Kayne for minimalist Cali girl designs. Wander the Montecito Country Mart where you will find Co, a pop-up shop by one of my favorite cult Cali designers, as well as chic tabletop shop Hudson Grace and swimwear favorite Malia Mills. My amazing friend Kerri (again, see saint above) introduced me to Raoul Textiles on State Street in Santa Barbara, the showroom for the company’s exquisite hand-printed textile designs, as well as select furnishings and accessories from favorite California based companies. Days can be chilly in the shade and in the evening or quite warm in the sun. This time of year, I choose pieces that still work for summer and warm weather holidays, but can easily transition into layering for fall. My hubby and I recently took a beautiful road trip through Spain and Portugal. In Madrid we visited the stunning parks and inspiring museums by day and ate at the chicest restaurants by night, while in Seville we wandered through the ceramic day dream that is Plaza de Espana and had our fare share of tapas by afternoon with a side of Flamenco into the wee hours of the night. La Alhambra and Generalife in Granada is a design and architecture dream and can keep the garden lover smelling the roses for hours on end. By the time we reached the red cliffs and white sand beaches of the Algarves in Portugal, our days were spent boating along the coast, sipping rose by way of breathtaking views and enjoying dinners with our feet firmly in the sand. Meandering up and down the windy streets of Lisbon, we explored the tile-laden architecture, shops and restaurants, immersing ourself in the city. Our many photos (um...ok, thousands), which ranged from the scenery to GC jewels to city nights, inspired many attire inquiries and I found myself DM'ing tons of insta friends, directing them to favorite designers, many of which I purchased on MatchesFashion.com. Matches Fashion recently celebrated their 30th anniversary and they are one of my go-to sources. 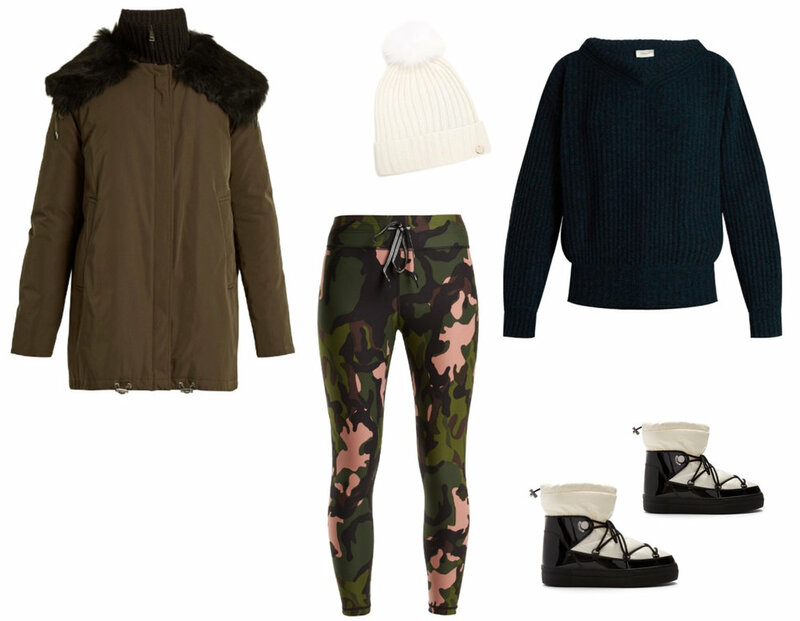 Dedicated Chic X Matches Fashion Packing List! Matches ships DHL (Free Delivery and Free Returns with code: USAFREE) and any returns may be organized by requesting a DHL pickup or by dropping it off at a UPS location that accepts DHL shipments as well. I'm a bit enamored with their luxe boxes and packaging which I reuse in my closet to organize trinkets. I've fashion packed for you a range of my favorite designers and pieces that will do double duty for your end of summer adventures and for transitioning into fall. I've included amazing sale finds that are perfect for storing away in anticipation of a winter getaway and shoes and sunnies that can keep you going from day to night (gotta save room in those suitcases for shopping).